Need advice about a specific Nissan Altima problem? Chart based on 50 repairs. 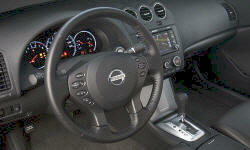 See TSBs and recalls for the 2012 Nissan Altima. Chart based on 43 repair trips. The repair cost chart excludes repairs made under warranty, do-it-yourself repairs, and repair trips that include maintenance. See repairs for all Nissan Altima model years. 5000 mi DIY repair for several rattles in the cabin. Pass. side a-pillar, cupholders, trim around nav unit, and glove compartment. Spent around two hours to resolve them. Wrapped most clips in thick tape, adhesive felt in a couple areas. 5700 mi Water leak around the driver's door during extended rains. Dealership replaced the seal around the door. 38000 mi Water was entering the turn signal light in driver's side mirror. The signal housing was replaced. 67000 mi Repetitive whirring noise at 25-35mph, vibration at higher speeds. Wheel bearing was determined to be the cause. Replaced under Nissan extended warranty. US $800 Rear sway bar bent. Elected to replace with aftermarket rather than install the same faulty part under warranty. $300. Replaced front struts and rear shocks due to poor handling. Also replaced all related mounts/bearings. Front driver strut mount was causing a knocking sound prior to replacement. Rear driver shock was failed entirely, both rears leaking. $500. 97000 mi Replaced driver front wheel bearing due to noise and vibration. US $35 Speaker in front passenger door failed. Replaced. 2700 mi Trunk lid was crooked and rubbing on the bumper. Exhaust was not aligned properly and one muffler was lower than the other, as well as one stuck out more than the other. Paint Defect on the roof that looked like a 2 inch worm was painted over. Sharp burs around the wheel well lip. Dealer will need to file and paint. Passenger side seat would not move. Not able to adjust it. US $20 Got a check engine light, reader said it was MAF. I cleaned MAF and changed Air Filter. Light stayed out for about 400 miles and came back on. I checked for Vacuum leaks and tightened some clamps. Light came back on in about 300 miles. Found there is a TSB on Issue and Nissan would not perform and wanted to charge. I reset the light and it has been out for 300 miles. No drive-ability issues and no MPG issues. TSB fits perfect, and computer needs updated and I am not paying them for the problem that they caused. US $1200 Ac compressor had to be replaced. 49900 mi From wheel bearing. 65400 mi Took the car into Costco as I had a warning light. They told me that the tires sold with the car were not recommended as they would not support the weight of the car. Had them replace all tires with recommended tires. Also had a tire sensor replaced. 67360 mi Pushed white fuse into place so that Air Conditioning would not come on each time car is started. Apparently the factory does not fully insert it as it can drain the battery in the car lot. C $700 Rotors were warped Replaced them and got new brake shoes as well. US $1500 A/C/stopped working. Needed new compressor and condenser. US $200 Transmission needs to be replaced at 147,000. I called Nusssn America and they would not help. I’ll never buy a Nissan product again. 40600 mi Broken cat converter mounting. Dealer replaced exhaust manifold with cat converter mount. Nissan warranty for cat converters is 8 years or 80,000 miles. No charge covered under warranty. 25300 mi Vehicle threw a code for throttle position sensor. Dealer replaced O2 sensor under warranty. US $200 Rear brake disc replacement due to excessive runout. US $200 Replace worn rear shocks. Should be considered maintenance rather than problem. 111000 mi Timing chain tensioner made rattle noise for 1-2 seconds on cold start. Not a problem, but wanted to be sure. Change of oil from 5w-30 conventional to 5w-30 synthetic seems to have quieted the tensioner. Noise no longer there at this time. US $225 MAF sensor previously replaced. Check engine light returns with same MAF code. ECU reflashed with an update from Nissan that is supposed to solve the false MAF code that keeps returning.. Did not work, code returned. US $225 Heat shield above transmission was rotten and vibrating against the transmission causing a noise that sounded like it was coming from the transmission. Shield was removed and CVT fluid changed while car was in shop. Problem solved and car drives smoother with new fluid. US $350 Mass Air Flow sensor failed again, setting the car in limp mode. Grounds checked, potential vacuum leaks checked and MAF replaced with genuine Nissan part. ECU reprogrammed for new MAF. This is a revisit of a problem that has occurred in the past. I suspect an aftermarket MAF was used by the shop that previously attempted the repair, though I was told the part was OEM manufacturer. 19000 mi faulty o-ring replacement in oil housing. 7000 mi Audio sound level is diminished most of the time. 14100 mi Cylinder head got stuck. 49000 mi Valve stuck engine was junked. 39100 mi Rust appeared near chrome plating on trunk, near trunk release button. Discovered prior to 36000 miles. Dealer seems familiar with this issue and kept car for 1 week to redo paint and replace chrome parts on trunk. Provided loaner car. US $50 Oil cooler to block gasket was leaking. Replaced gasket and O ring. US $600 Water pump leaked and seized up. Replaced water pump and belt. 1000 mi AC problems, not enough refrigerant. Fixed by adding some. 23000 mi Acceleration surge. I complained to the dealership but they mentioned the surge is normal for a CVT. I wasn't too happy with it, so I sold the car. 26700 mi Noise coming from the engine area, audible in the exhaust pipe also. They could hear the noise at first, but found nothing, later no more noise. They said probably something in the air intake, later blew out. See our lemon odds and nada odds page to see vehicles with no repairs or vehicles with more than three repairs. 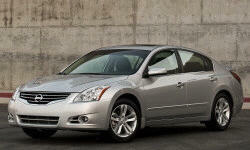 To see how frequently 2012 Nissan Altima problems occur, check out our car reliability stats.